This appealing little arrangement with its shy Roses in soft pink pastels mingled betwixt purest white Oriental Lilies discloses it's message delicately and softly, with a subtle, vestal yet alluring hint of come-hither.Lilies may be sent closed/partially closed in order to prevent damage and to last longerYou can send a super double surprise by adding a little extra with your gift. We recommend a Premium Box of Chocolates to add to Delicate. Quick, reliable service. Easy company to deal with. 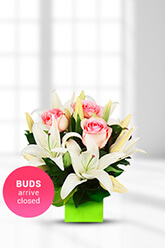 I ordered on Fri after lunch and the flowers arrived that afternoon. They looked liked the picture on the web page. Can't be happier than that! Great service, will definitely use it again! Our Son and daughter in law were very happy.